Nobody ever discusses the most equal trades of all time. Conversely, the awful trades come up periodically: Jeff Bagwell for Larry Andersen, Nolan Ryan for Jim Fregosi, Frank Robinson for Milt Pappas, Derek Lowe and Jason Varitek for Heathcliff Slocumb, Sparky Lyle for Danny Cater (and a player to be named later, Mario Guerrero, who evened out the deal a little, at least to me), Lou Brock for Ernie Broglio, Babe Ruth for No No Nanette. I guess the even trades seem to have a way of dissolving in collective memory. No scars are produced. I could only think of one equal trade without Googling “equal trades” and “baseball,” a search which turned up even less than the trade I’d thought of on my own the moment I looked at this card: Toby Harrah for Buddy Bell. No minor league throw-ins, no cash, no players to be named later. One guy for another guy. Perfect. revealed him to be, statistically speaking, the second-best clutch hitter of the last 35 years (behind Mark Grace). Bell’s career lasted a little longer than Harrah’s, and he also was one of the all-time best defensive third basemen, whereas Harrah in the field was merely like he was at every other aspect of the game: pretty good. James mentions how nice a guy Bell was several times throughout his book, so maybe that helped Bell move up a little versus Harrah in his estimation, especially considering that his entry on Harrah consists of an anecdote about how as a very young player Harrah was among those on the Washington Senators secretly lobbying for a mutiny on manager Ted Williams. But anyway, as trades went, the 1978 exchange of Bell and Harrah struck me at the time as perfectly balanced, and I still see it that way, each team getting a good but not great third baseman in his prime. Beyond that, the trade seems perfect to me because of the teams involved. The players changed teams but nothing really changed, good or bad, not for the Rangers, nor the Indians, nor Harrah, nor Bell. First place remained a rumor, decent personal statistics were compiled, empty seats bore witness, and history continued to unfold elsewhere. Rob Nen would also make the Palindrome baseball team. There is something fast approaching art here, and so in keeping true to my white trash heritage, I will now miss the point entirely. Dammit, though, I just can’t help it. When I see the name Toby, I ask myself, Toby wants to go for a test drive, don’t you, Toby? Every damn time. If only there was a Kurt Russell baseball card I could offer to balance out my trangression… but no. There may be a Kurt Russell card out there somewhere, gus and fer. He played minor league ball from 1971 to 1973. Thanks, Jon. Russell made a kind of comeback later on in the 1970s in Portland with the independent Mavericks, a team owned by his dad that would make an excellent set of baseball cards. Perhaps Jim Bouton’s BIG LEAGUE CHEW could sponsor it…? On the USED CARS dvd commentary, Russell mentions drawing inspiration from several of Portland’s classically unsavory auto salesmen; on behalf of the Rose City, we’re glad to have helped in some small way. I did not know this until just now, but Russell is Matt Franco’s uncle. He also was the Crash Davis that Ron Shelton had in mind when he wrote BULL DURHAM. This inter-web thing is a freakin’ miracle, I tell you. Kurt Russell also appeared in several episodes of the Disney TV show, which also briefly featured The Rifleman, Chuck Connors, who played professional basketball for the Boston Celtics and major league baseball for the Los Angeles Dodgers. I’m tempted to try to find a connection between Connors and “Used Cars” but I haven’t the stomach at the moment for such terrifying metaphysical investigations. Whoops! Regarding Chuck Connors: Make that the Brooklyn Dodgers (for one game) and the Chicago Cubs (for 66 games). I must have been thinking of famous Brady Bunch actor Don Drysdale, who unbeknownst to many had “a cup of coffee” with the Los Angeles Dodgers before embarking on a career as a thespian that would include a role in a 1962 episode of the Rifleman. Dave Burba for Sean Casey worked well for both teams (56 wins over 4 seasons). 3. Buildabong, that is an underrated fair trade. Burba really quietly did rack up the wins there for a while. …the Rangers got about 75% more value out of Bell than the Indians got out of Harrah over the time frames each club had them after the trade. (Harrah went to the Yankees in 1984, and then was back on the Rangers in 85). If you look at the annual numbers, Bell surpassed Harrah not just overall, but in every year, too. Maybe it appeared even at the time, but, at least according to WARP, this was much better for the Rangers. 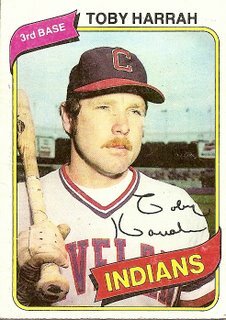 Toby Harrah and my former stepdad were both from Sissonville. It is important to realize no town of Sissonville actually exists. Sissonville is not so much a place as an area that spreads like an oil slick across five incorporated cities and two counties northeast of Charleston, WV. Sissonville, apart from being the birthplace of Toby Harrah is best known for a locally made speed concoction known as “Sissonville Slimfast”. http://www.dailymail.com/News/Kanawha/200907240195 Like the deities cavalcaded before us here in cardboard, Sissonville does not firmly exist in the tangential but is merely a state of mind. This one always intrigued me as a kid as well. I think that I intuitively knew that trades of players at the same position just don’t happen that often. In one of his books (the first Historical Abstract maybe?) I seem to recall James referring to these as “challenge trades” and he recounted some club from the 30s (the Senators as I recall) making a bunch of them in one offseason, and then winning the 1933 pennant. I’m sure I’ve got some of those details wrong. Other trades that come to mind: Cooper for Scott, 1977 (not at all equal, but the Sox brass at the time actually thought they were getting the better of the deal); Max Flack for Cliff Heathcote (outfielders traded by the Cubs and Cardinals between games of a doubleheader they were playing), and of course the most equal trade of all time, Harry Chiti for Harry Chiti in 1962. Which baseball-reference now says didn’t really happen, but when I was growing up that was the story, and I’m sticking to it.